So what is the best mouse poison? We wanted to make a list of all of the best rodent poisons we could find, so we spent days researching and reviewing as many of the highest-rated poisons we could find. Then we compiled the list together and chose the top ten best rated. We used a few stats when trying to pick out the best of the best; each stat can also help you to pick out the best one for your home. Here they are, with an explanation of what each one means. Count - How many are in a package? Some of these poisons will come in bulk, some will come in single packages. We’ll let you know the count. Usage - Are these poisons safe for your home? Some poisons are designed mostly for commercial spaces, while some are okay for the home. 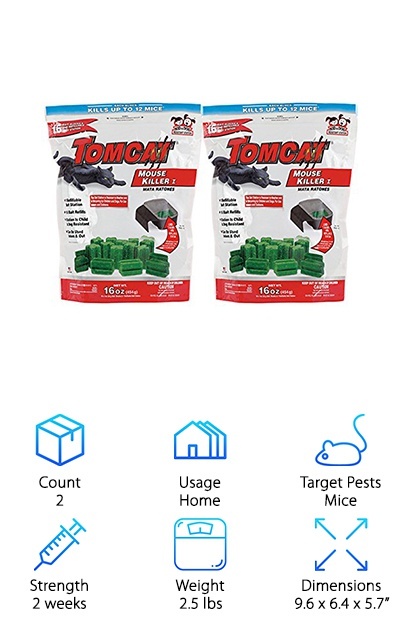 Target Pests - What sort of rodents is the poison designed for? Some are made the be used on rats while others are designed for mice or other pests. Strength - How long do the poisons last? Some are meant to be used every few weeks, some every few months. This stat will be measured in weeks. Weight - How much mouse and rat poison are you getting with your purchase? We’ll usually measure this one in pounds for easy reference. Dimensions - Make sure you have enough room for the package of the poisons in a safe place in your home, away from pets and children. In our opinion, First Strike Soft Bait is the best mouse poison on the market. This is soft bait is perfect for high-infestation areas where other food sources already exist. This stuff really draws the rodents in with an enticing food aroma and easy to eat, easy to share poison that makes rats and mice want it, even if you have other food around. It’s designed to be enticing to the rodents, and it kills with difethialone. The rats or mice eat the difethialone, and they die about three days later. The only downside of difethialone is that you don’t want it to touch your skin, and you should also keep it away from pets and children. 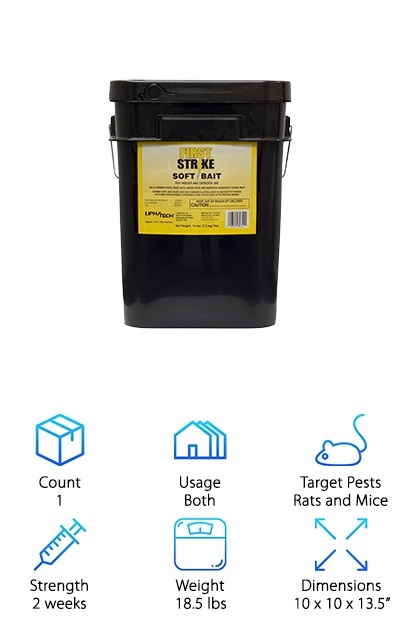 However, if you have a terrible infestation problem, First Strike Soft Bait is our number one Top Pick for how to rid of them. This two pack of Old Cobblers Just One Bite will take almost any infestation you have in your agricultural building and get rid of it! These two bricks of poison are designed to be placed about 8-12 feet apart, giving you scurrying little squatters plenty of poison to feast on. The active ingredient is bromadiolone, which is some powerful stuff. It takes four to five days for them to die, keeping the second wave of rats from knowing it is poisoned until it is too late. These bricks are designed to be used with bait stations. The bars are scored and can easily be broken up into smaller pieces to give you more coverage. This stuff is cheap and powerful and will work on any rice or mice you may have in your agricultural building! Looking for something that doesn’t need a trap? 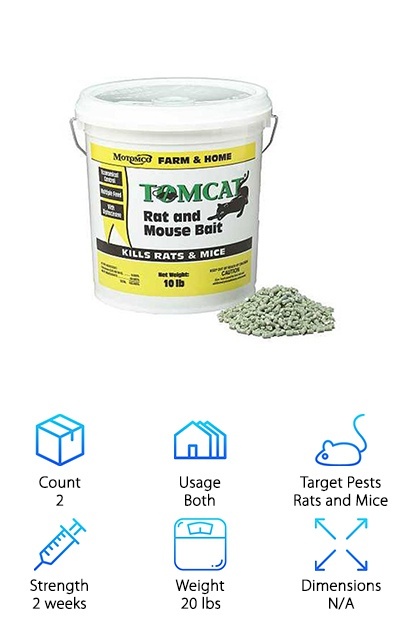 Motomco Tomcat Bait Pellet is some of the best mouse bait poison around that comes in pellet form. It kills just about any kind of rodent around, from Norway rat to house mice. Made in the USA, this effective treatment is made with warfarin. It’s very effective because rodents are drawn to it like moths to a flame. This stuff is not safe around pets or children but is otherwise a fantastic product that is great for home or farm. 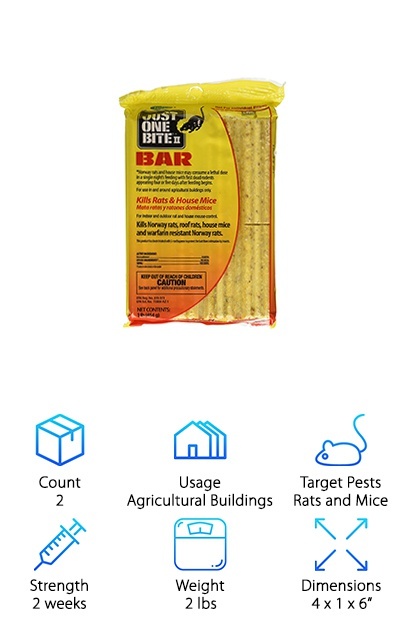 It’s cheap, comes in bulk, and will help to keep your building as rat free as possible. So if you’re looking for a poison that doesn’t require a bunch of expensive traps, then make sure to check out Motomco Tomcat Bait Pellet. It’s even more effective than a tomcat! What makes JT Eaton Bait Block one of the best mouse poisons around? The peanut butter flavor and scent is highly attractive to rodents and pests. Once they eat some and take it home to the family, all of the rats will die from the active ingredient, diphacinone. The small blocks are easy to use and can be used against any smaller rodents. This is a first-generation only product, which means it is very unlikely to hurt a pet cat or dog that may eat one of the dead rats. They feature a small hole in the center to hang it from a pin if you need to. Or you can put it in a bait station. And the best part is the limited, one-year warranty to protect you against ineffective product! The Neogen Havoc Bait is a great bait for industrial, commercial, agricultural, and other buildings. 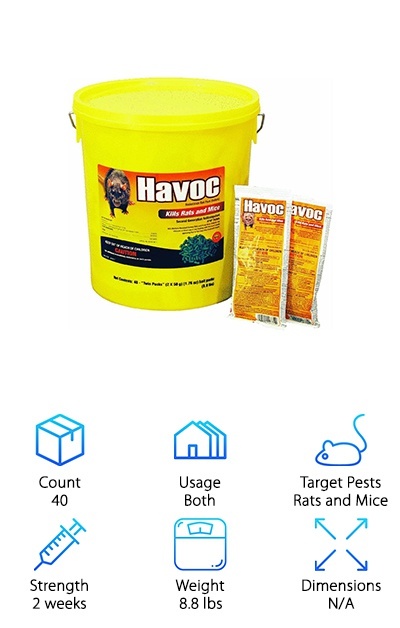 No matter where you have rats or mice, Neogen Havoc Bait is coming to the rescue! These little pellets come in packages of 50 grams each, keeping the rest of the bait sealed and fresh even after you open a pack. The main ingredient is brodifacoum, making this a great product to kill nearly any sized infestation of rodents. The mice and rats eat the pellets, dying within a couple of days. The pellets are extremely powerful, and they get to work immediately on your rodent problems. They can be used with or without bait stations too, making them convenient for everyone. We liked this bait for its quick and brutal efficiency, and we’re pretty sure you’ll like it too. Looking for a quality bait-station-and-poison solution to your rodent infestation problems? The Tomcat Mouse Killer is a low profile station that makes it easy and safe to use indoors. 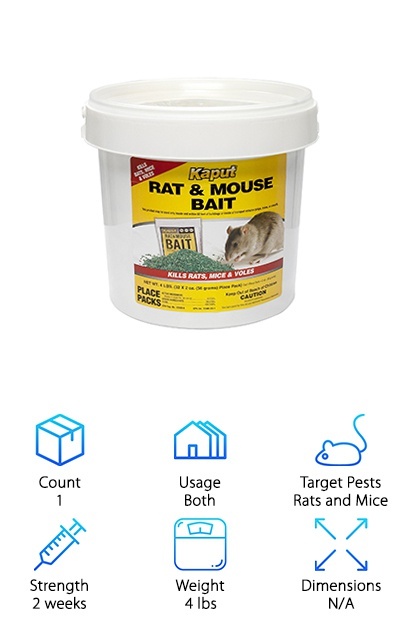 This allows you to have bait around for mice and rats while protecting children and most pets from consuming it. Its small size makes it perfect for small spaces where mice are more likely to hang around. It has a key to lock it up against little fingers and paws getting inside, locking automatically when closed. 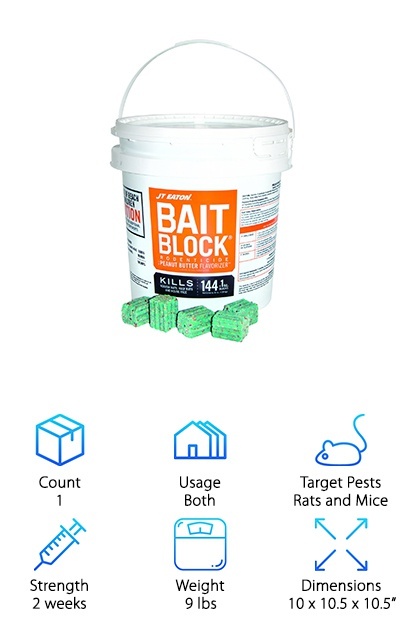 This bait station comes with poison; it is bromadiolone-based poison that kills mice with little chance of secondary poisoning. The peekaboo top also lets you know how much of the poison remains inside of each station at a glance. The bait station is also reusable and makes using poisons around your home just a little bit safer. And we love products that put safety first! One of the keys to making the best mouse and rat poison possible is redesigning your products to solve problems. 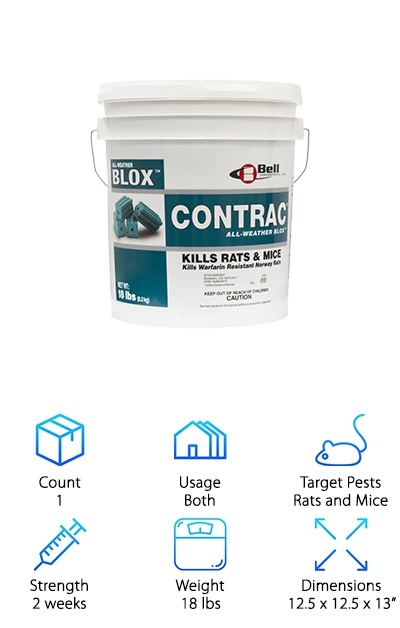 The Contrac Blox Rodent Control is just such a product! This is a bromadiolone-based poison that is designed to be less deadly to non-targeted animals. This reduces the possibility of secondary and primary poisons to children, pets, and other non-rodent animals; it also has an easy antidote of vitamin K that is easily accessible and easy to administer. This poison should still be in a bait station, just to stay on the safe side. This stuff can last up to three years if kept in sealed containers and kept at a moderate temperature. This makes it very practical and much safer than most other products on the market. And that is a really good thing! Ratx Rat Bait is just for rats and mice! The package promises that this is 100% safe for people, pets, and non-rodent wildlife. It’s a natural compound made from mostly corn gluten meal and sodium chloride that blocks the rodent’s system and causes fatal dehydration. Although it may take a little longer than poisons to get rid of your rats, this bait is completely natural and safe. It won’t hurt the environment or poison any other animals except for your rats. It’s so safe that is requires no special handling, storage, or disposal instructions. 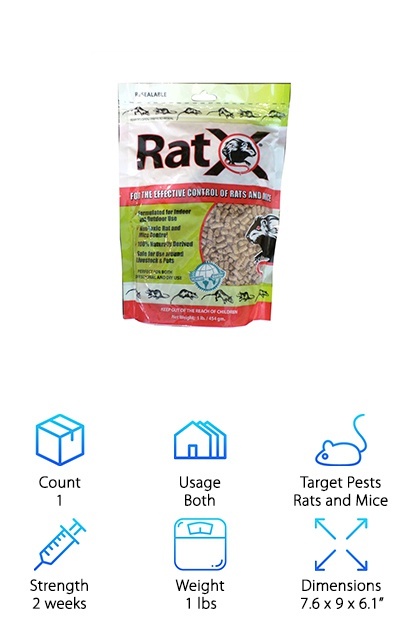 So if you have a space with a lot of other, non-pest animals and little humans, this a great product to consider. It is effective, friendly, and safe. And there is nothing more important than safety when it comes to our homes! Want a trap that also includes poison to fill it? 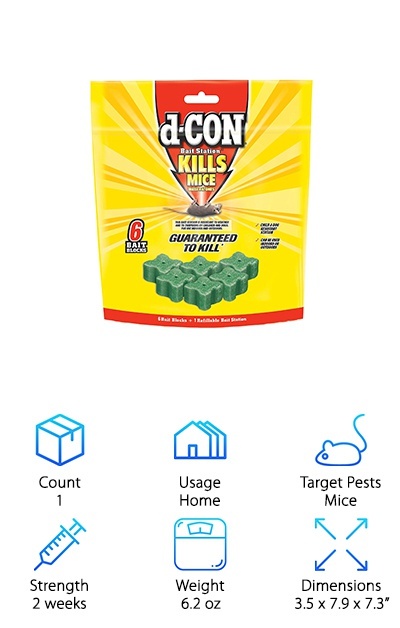 This mice-only d-CON Corner Fit Poison comes with everything you need to get started on finishing that infestation. The bait station is designed to keep animals and children out while letting mice wonder in freely. They eat the Diphacinone-based poison, then leave to die later. The compact design means you can put this station anywhere you are having a problem, like behind appliances, in attics, under porches, and even in cabinets (away from food, of course!). It can be used indoors or out and will resist weather. And the d-CON Corner Fit Poison also comes with a kill guarantee; if you follow the instructions and your mice problem doesn’t end, you get your money back! And that’s a lot of confidence in their product! Need something that also kills voles? Kaput Vole Bait is designed for mice, rats, and also their tiny relative, the vole. This stuff is designed to kill the whole colony dead in about two weeks, making quick work of your troubles. It is recommended to be used with bait stations if other animals or if small children are around. This stuff is made with warfarin, which is a powerful anticoagulant. However, it has low secondary toxicity and is safer for the environment than some of the other chemicals. The bait can be used in a bait station, as loose granules, or it can be left in the packaging which is made for the rats and mice to be able to smell the food through it. And it’s cleverly made to mimic the texture and taste of the grains that rats and mice already love!